The Alienware 17 is a nearly perfect 17-inch gaming laptop, and the Graphics Amplifier only makes things sweeter with a beefy desktop GPU. In the age of shrinking laptops, it's nevertheless unbelievable that hulking 17-inch gaming laptops still exist. Even gaming laptops are not immune to the changing tides of the mobile computing world, the Origin EVO15-S and Aorus X7 Pro will tell you. Now Alienware is getting in on the shrinking notebook race this year in introducing a new, slimmed down version of its 17-inch gaming laptop. Measuring in at 1.35 inches thick, it's noticeably thinner than the company's previous gaming rigs. But don't think performance has been sacrificed for a thinner profile, because the new Alienware 17 comes packing an Intel Core i7 processor and an Nvidia GTX 980M graphics chip. What's more, Alienware's shiny new Graphics Amplifier now works with the 17, which lets you connect a desktop GPU into your gaming laptop for even more power. But for all its innovations as a gaming laptop-desktop hybrid, this winning combination runs into a few more speed bumps than the MSI GS30 Shadow with GamingDock. Alienware is well known for some of the industry's flashiest, most divisive gaming laptop designs. And so it comes as a bit of a surprise to see the company's latest 17.3-inch machine slightly toned down in regards to the customizable Alienware FX lighting zones. You'll still be able to modify the color and pattern of eight lighting zones, but they're a smaller focus on the new Alienware 17. Unlike last year's model, the lighting strip around the base of the machine does not whip around the front edge and extend to the sides. Instead, you'll only find one short band of illumination at the front of the laptop. This, along with cutting out the optical drive, was done to help cut down on the thickness of Alienware's classically chunky machines. Luckily, not much has changed with the other lights on the laptop. The keyboard still splits apart into four distinct lighting zones. Meanwhile, you can also set the lid to act like a signal light pulsing with every shade of the rainbow, there is a new light up Alien head logo above the keyboard that perfectly matches with the Alienware typography beneath the screen. Of course, the lights aren't the only thing that's changed with the new Alienware 17. The laptop also has an unmistakably slimmer waistline and as a result it's slightly less angular. The bottom of the laptop, for example, caps off with straight and short lines compared to the round bottom machine from last year. Likewise, the rear corners of the Alienware 17's screen lid also fall off to a much more gradual slope. Overall, these are welcome changes. Sure this Alienware 17 isn't as ostentatious as the other machines from years past, but this new model skips some of the fluff and focuses on squeezing even more performance into a tighter package. Alienware might not have been the first to introduce GPU boxes, but the company definitely has one of the more elegant solutions with its Graphics Amplifier. Inside of this optional laptop accessory, which looks like an oversized bread box from the future, you will have space for a desktop graphics card. Of which, you'll have to supply that part on your own, if you want to supercharge your gaming experiences with the Alienware 17. The good news is the Amplifier comes outfitted with a 460-watt power supply that should be more than enough to run even a top-end Nvidia GTX Titan X graphics card. Connecting the Alienware 17 and Graphics Amplifier is a simple matter of plugging in the proprietary four-pin PCI-Express 3.0 (PCI-E) cable to both devices. With a PCI-E cable, Alienware's solution is much more flexible, letting you move the laptop while connected. By comparison, the GS30 Shadow is locked on top of the GamingDock while it's in use. 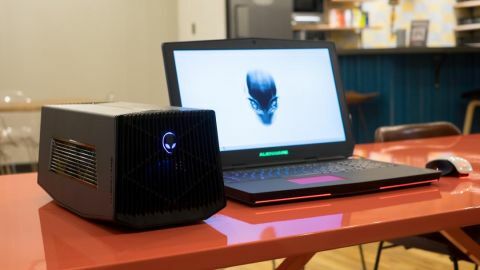 What's more, unlike the GS30 Shadow, you can use the Alienware 17's gorgeous 17.3-inch IPS screen while it's connected to the Graphics Amplifier. MSI's GamingDock, meanwhile, requires you to plug in the hybrid device into an external monitor. That makes MSI's combo decidedly more of a desktop than Alienware's flexible setup.